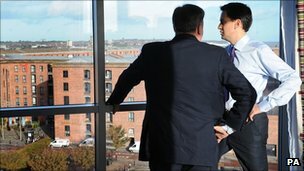 Can Labour rebuild under Ed? I don’t believe so. Tony Blair and his vision of New Labour, managed to turn a party for working people to a party desperate to win the vote of middle England; David Cameron is more of a Blair Babe than anything else, to the the extent that Cameron is using Blair as an advisor on policy towards Palestine. The question is how can Labour return, reinvent or reconcile itself with the country in order to be elected but also represent people who aren’t as fortunate as the people who claim to represent them. With Ed and Ed in charge, Labour have not got a hope; Mr Balls was an economic advisor to good ole Gordon from 1994 – the Tories will not let the public forget that – and Mr Milliband was an anti David vote. Nobody wanted a Blairite in charge of the party, so Ed became the man as the other candidates fell away; it wasn’t a vote of confidence, more a vote of admitting that the party has lost its way from it’s roots and needs to regroup. How Labour position themselves on the planned strikes will dictate to how they will reform.